The house is like a novel. For many years I called it “my father’s house,” but that was wrong. It is my mother’s house, and it has always been. It is my mother’s novel. It is my mother’s house, my mother’s novel, because she is the one who found its bones. She was driving from her home in Worcester, Massachusetts, to Cape Cod, when, passing through the town of Middleboro, she saw the old house. It was scheduled to be torn down so that the new highway, Route 495, could be built, and my mother pulled over, curious. 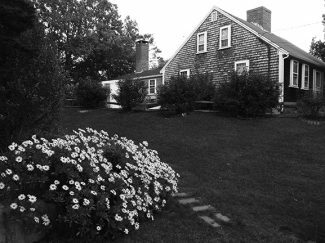 The house had been built in 1726, a real Cape Codder with cedar shingles, wide oak floorboards, and thick hewn beams the color of chocolate. Before my mother left she had purchased the beams, floorboards, and paneling for fifty dollars. She knew just what she was going to do with them, too. A couple of years before my parents had purchased an acre of land on Cape Cod, buying it for one of those ridiculously small amounts of money that make future generations so envious. They had not been able to afford to build on the land yet, however—until now, that is, until my mother found the bones of what my family would always call the Cape House. It is of course a sign of great good luck, and unusual privilege, to grow up in a family that owns two homes, particularly in a country where many own none. It was less obviously so back then, when each Massachusetts town seemed to have a corresponding summer town on Cape Cod, and when the houses themselves were modest, cottages and beach houses, and not the swollen re-creations of suburbia they have become. If that sense of privilege was not often verbally appreciated by the children in my family, it was bodily so. Every summer after school ended, my mother and the four of us headed from Worcester down to East Dennis, not to return again until after Labor Day. That meant summers of romping on the beach and swimming in the bay and bonfires and lobsters and never getting the sand completely out of your sheets. It meant a second group of friends, a better group, to my mind, and a house that my mother ruled with an easy hand, since my father, and his temper, were only weekend visitors. There was a casual sloppiness to the house that she embraced and he resented, and while it was too small for our boisterous clan, that didn’t matter, as we were always spilling out onto the beaches and into the water. Outside, cedar shingles covered the exterior walls like scales on a reptile—organic, living—and the roses seemed to hold up the rickety fence. The house changed little over the years while every­thing around it changed. Most of the modest houses in the neighborhood were torn down and large McMansions were built in their places. While these new buildings jutted out their chests, Trump-like, the Cape House kept humble. The house sometimes felt as much role model as dwelling. It stayed fine, artistic, modest in the midst of the arrogant, new, and crass. It could laugh at itself. It had a few pretensions—who doesn’t?—but it mostly let it all hang out. It didn’t cover its beams. They were right there, rough-hewn, crossing the ceiling of the living room and dining room for all to see. Of course in this day and age, in any day and age really, Cape Houses are pretty much doomed. They are built against that doom but with the knowledge that they’ll succumb to it. They never really stand a chance; their only hope is to be a beautiful failure. It is early March 2016 and I am back on Cape Cod, packing the layers of our lives into boxes. Jammed into a crawl space, insulation in my hair, I perform triage on our family’s past, tossing out this photo, keeping that one. I feel like I have fallen down a memory hole. Anything, even the storm windows—how many goddamn times did I put those down or up, with and without my father?—can send me time traveling. One minute it is 1983, and I am living here for the off-season for the first time, and the next it is 1971 and I am ten and romping with my gang, riding our bikes up to Scargo, and the next it is May 2003, when we first brought my daughter here less than two weeks after she was born. The only place this time machine won’t travel is to the future, and I am glad for that, as in that future it will no longer be here. We are finally selling the house, and the chances that someone will buy it and leave it as it is—modest, shambling, beautiful in a shabby way—are almost nil. The small falls to the large, the quiet to the loud. My mother clings to the idea that someone like-minded, someone equally artistic, will buy it and preserve it. It’s a nice possibility but the truth is that the buyer will almost certainly tear it down and start anew. My job this week is to clean up this place, throw out as much as I can bear, box up personal items and store them in closets as I get the house ready for what realtors call “staging,” in preparation for sale. “It must be so sad” is the almost universal response from friends, but it isn’t, not really, except in occasional melancholy moments. Mostly I am remembering how much I love Cape Cod in winter, the sense that you have the whole place to yourself, the feeling of double retreat here, of other people leaving the place just for you. And even more directly I am hit by this: just how beautiful this place is. The salt marsh rung with ice, the seals lounging on the rocks, the sun rising over the harbor. The house sometimes felt as much role model as dwelling. It stayed fine, artistic, modest in the midst of the arrogant, new, and crass. It could laugh at itself. It is here that I first determined that I needed to live in beautiful places. After graduating from college I was the first member of our family to spend a winter in this house. I had read my Thoreau and knew that his paradise was based on squatting on someone else’s land, and, after some squabbling with my father, and making earnest promises to pay for upkeep, be prompt with the bills, and winterize the house, determined that I would do the same. This was the period when I often referred to the place as “my father’s house,” maybe because my father had lodged himself in my headspace as I left college behind, and I felt as if he was watching my every move. In fall 1983, a fall when the weather records confirm my memory that summer carried all the way to October, I moved into the Cape House with my oldest friend from Worcester, Dave Rotman. Together we were starting a poster business, the posters based on political cartoons I had drawn in college. The business would be a failure, but that fall was not. As the summer people all left, migrating birds swept through the neck, and standing on the back deck we could see their flight and hear the ocean, accompanied by the dinging of halyards on masts at the harbor. The post oak by the side of our house shook wildly in the salt winds, and I made it a rule to only piss outside, so I wouldn’t miss any part of the show nature was putting on. It was later that fall, after many years of vows and timid false starts, that I finally began to write. Now I wade through mountains of paper, drafts and drafts of books, notes and outlines for novels, and hundreds of cartoons that I drew when I moved back into this house in my late twenties and worked as a cartoonist for the Cape Cod Times. Samuel Johnson called writing “the epidemical conspiracy for the destruction of paper” and I see his point. I toss some of the old drafts, but can’t quite bring myself to toss all of them, boxing them up instead. As it happens, one of these novels had a first-person narrator who has returned to pack up his family house on Cape Cod before selling it. It was written years ago. To a young writer or a nonwriter it might seem astounding to write fiction that later comes true, but it has been my experience that this happens all the time, that we anticipate illnesses, deaths, affairs, and other events in our prose, often years before these things actually happen. Long before my brother got sick or my father died in real life, for instance, they did so on the page. When I am tired I sit down on a stack of old unsold posters and think of Thoreau’s quip, after the hundreds of unsold copies of Walden were returned to him: “I now have a substantial library, mostly made up of my own work.” What do I make of these thousands of words, these hundreds of thousands of words, swirling around me on these pages? All these pieces of paper trying to preserve what is beyond the paper. Trying to nail down life and stop it from moving for a minute. Trying to put a halt to this unceasing movement forward, this ungraspable and unhaltable thing. I am hit with a triptych of memories. Of John Hay, the great Cape Cod nature writer, and how not just the desk and chair from his studio, but the drafts of his late work, were found by a neighbor in a dumpster after he died. Of my brother, whose sickness, which came on in his early thirties, manifested itself partly in graphomania, a constant scribbling on pieces of paper, on his clothes, and in the notebooks I am now finding with notes like “Urgent: Do Not Throw Out” on their covers. Of the night when Nina, my wife, and Hones, my old friend, were eating enchiladas in the dining room when suddenly Nina noticed the strange glow coming from the living room, and we raced around the corner to find that the fire I’d made had gotten out of control, burning up the newspapers and kindling we kept in the wooden crib—the very crib that my sister and I had been rocked in—as the flames licked over the mantle. Had not Hones dragged the crib out, and Nina aimed and sprayed the fire extinguisher, that might have been the end of the house I was still then calling my father’s. Maybe it would have been a better end than this one, a more fitting end, or at least more spectacular. Nina and I moved back here to live for a while in our late thirties, soon after we were married, but she did not come along on this latest trip. Hones is here, though, and tonight so is Dave Rotman, down from Worcester, and later, after his shift at work, my brother Scott will come by too. For appetizers we eat oysters that Hones picked out of the muck on the beach near Crowe’s Landing, and, of course, we drink beer. This house, among other identities, was a party house, and to not include that would fail to round out its full personality. Hones has been down here all week with me, helping me box and pack, despite the fact that the water is off for the winter. Luckily, there is a bathroom down at the harbor, and though there’s a combo lock on the door, it magically opened the first day when Hones typed in 1-2-3-4. Now “going to the harbor” has become our private euphemism for pressing needs. Between Dave and Hones, they have spent hundreds of nights in the Cape House, and as the night wears on they are more openly sentimental about the impending loss than I am. When Scott shows up I bring him the old notebooks marked urgent, but, medicated now, he waves them off, uninterested. They were written by another person in another life. It is nice to have old friends gathering to say good-bye to this place, but as I continue to box up the next day I focus on those who are not here. My father, obviously, who has been dead twenty-two years now, and whose ashes were divvied up so that half could be spread out on Cape Cod Bay and half buried below the headstone over on Quivet Neck, close to where Hones gathered the oysters. But no—not my father today. I have given him enough of my psychic life, my mental life and my writing life—whole books dedicated to him. Just as this is not my father’s house, it is not my father’s essay. My mother, still young at fifty-six, was left behind when he died and had to fashion a new life. By all rights one of the first things she should have done was sell the house. Though my father had scrambled to set her up before he died, she had little financial sense and in the years since has worried constantly about money. During those years she lived in Charlotte, North Carolina, where my father had moved for business before his death, but still migrated back to Cape Cod each summer. Every year she talked about selling the Cape House and every year she didn’t. And now it is time. The last twenty-plus years have been hard ones for my family, years of loss and compromise, and now we ready for another loss. My mother has been sick all winter and the doctors have not been able to put a name on the sickness. She isn’t even sure she can make it back up to Cape Cod for one last summer. It is time to sell, obviously, but she calls me every day, second-guessing her decision. I hear the fear and hesitation in her voice. She knows what this decision means, not just emotionally but symbolically, a harbinger of a greater loss. The greatest loss. I throw out my mother’s old umbrellas, golf tees, baseball caps, dead batteries, tennis trophies, and the wooden apples that have always been in that cracked bowl in the dining room. Hones wraps a couple of her paintings in newspaper; he will store them for me in his basement until I can pick them up. My mother never quite mastered perspective, but that just gives the work—paintings of our local marshes and sailboats and of huge blooming flowers—more charm. Like her house, she was an inspired amateur. This week has been in many ways a tunneling down, an archeological dig into my own and my family’s past. But there is a memory I cannot get to, a place I cannot uncover. Mother. What that word once meant. I try to really get back to what that meant at one time in my life. It’s impossible, I think. I usually give up and settle on father instead, father where the dramatic clashes and the rage and the sense of being judged and the focus on achievement are still readily accessed. Those memories come fairly easily. It is the other thing, the earlier thing, that I cannot reach. I manage a tear or two but it is not for the thing itself, but for my inability to get there. I feel cold, and I dislike my coldness. “I’m going to the harbor,” I yell to Hones. But I head to the beach instead. That is something else I learned here: to try and live in places where you can launch your favorite walks directly from your house. It makes a difference. I head down the beach to the bluff, away from people. John Hay always talked about our need for space, and at first I didn’t know what he meant. But I think he meant finding a place where you have elbow room, a place where you can wear sweats and never comb your hair, and a place where your main business is, to paraphrase Thoreau, between yourself and the universe. It is the sort of space you need to be creative, where you can be in what Melville called “a grass-growing mood.” It is yet another gift this place has given me. Last night I woke up and walked out on the back deck to piss and the stars were so sharp they looked like they could cut you and the cold felt good and made the warm sleep that followed delightful. It was so quiet and deserted in the middle of the night that you could hear one car cutting through the air all the way up on Route 6-A. Having this place has meant everything to me. I might have been a writer without it, but not the writer I am. I know who to thank for that gift. Sometimes writing seems merely the process of remembering what you’ve already been really thinking about anyway. I am now one year shy of the age my mother was when my father died, and I have been thinking more and more of loss. I turn it into a joke sometimes. Like last weekend when Hones and I visited some old friends in Falmouth—in part to take the week’s only showers—and over cocktails I told them that I was on a “Spread the Dread” tour, and that we are all “hurtling toward death.” But it is not a joke. For fifty-five years, her entire adult life, my mother has headed to Cape Cod every summer. This year she will not. So what, you could say, a wealthy woman will not get to go live in her second home. Boo-hoo. Okay, I take the point, but I insist that this house, and its loss, mean something. What it means for one family is that an almost umbilical attachment between memory and place will be severed. As with her novel, so with mine. Writing has its uses but it can only help so much. For all my scribbling as part of the epidemical conspiracy for paper’s destruction, I can’t hold on to what is passing. It slips ahead, the rushing days rolling into years, and then, momentum building like a set of breakers, into decades and soon into a lifetime. We look back at it through the layers, dig into it, try to put names on it or make sense of it. But we can never find it, because it is gone.